.law is a generic top level domain name (gTLD) for the legal industry proposed to the New gTLD Program of ICANN. After a private auction in September 2014, MMX, also known as Minds + Machines, won the rights to the string over the other applicants. .law is a restricted top-level domain open only to qualified lawyers and law firms world-wide. Application for a .law domain independent third party verification. 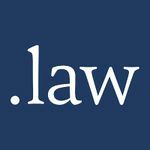 The .law top-level domain gives legal professionals the ability to increase their online presence and rebrand their practices and the legal services industry on the Internet using an industry focussed domain as a distinct, official, and trusted domain for the legal profession. MMX, also known as Minds + Machines, applied for .law whcih was one of 68 TLDs that the company applied for on its own behalf. This applicant submitted a Public Interest Commitment, which can be downloaded here. Radix- a subsidiary company of the Directi Group, which has applied for 31 new TLDs. The company partnered with ARI Registry Services to serve as back-end registry solutions provider. STRAAT Investments, a holding company founded & chaired by Juan Diego Calle and the parent company of .co Internet is also interested to become the registry operator of .law. The domain name string is part of the 13 new gTLDs applied for by the company with ICANN. Neustar will provide the back-end registry solutions for the TLD. Donuts (Corn Dynamite, LLC), one of 307 TLDs applied for by the company. This applicant submitted a Public Interest Commitment, which can be downloaded here. Famous Four Media (Silver Registry Limited) - This applicant submitted a Public Interest Commitment, which can be downloaded here. On February 26 2013, MMX announced that it had entered into a funding agreement worth $15 million to be used in the case of auction for a specific unnamed TLD. The investor will not receive ownership of the TLD but a share of future revenues. TLDH did not name the TLD that the funds are directed for, and it is in 11 head to head contentions and 12 featuring more than one contender. In a private auction that occurred in September 2014, MMX (Minds + Machines) announced that it had won the rights to the string over the other applicants. In the same month, MMX announced they had also won an auction for .vip and lost auctions for .design, .flowers, .group, .realestate and .video. This page was last edited on 8 December 2017, at 13:21.